This one is for my nephew, Dan Logan-Fasy, Attorney at Law. I’ve followed Dan most of his career and think his ancestors would be very proud of his determination, his fight for those who suffer in silence, and the grit he shows in finding them justice as did his 4th cousin, Walter Seth Logan, Sr.
Walter Seth Logan was prepared for college in the Suffield Institute and the Fort Edward Collegiate Institute. 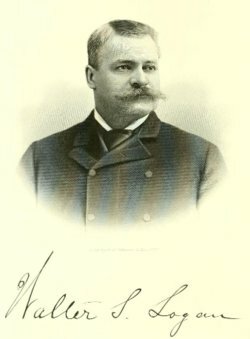 He was graduated from Yale in 1870, from Harvard Law School in 1871, and Columbia Law School in 1872, in which year he was admitted to the New York Bar. Entering the law office of James C. Carter, he became the assistant of Mr. Carter and Charles O’Conor in the famous Jumel will case, thus beginning under the most favorable auspices a career as a lawyer that has been full of successes and honors. Mr. Logan has been a leading spirit in the several reform movements of New York City, and was Chairman of the Executive Committee of the Ballot Reform. Association of New York State in 1887-1889, whose work has resulted in the present improved condition of our ballot system, greatly reducing the frauds so prevalent under the old system. Walter was born April 15, 1847 in Washington, Connecticut to Seth Savage Logan and Abigail Serene Holister. He was President General Logan of the Sons of the American Revolution. The article quoting his speech is in The National Yearbook and mentions that Walter Penn’s Secretary, James Logan, is related to us. I just haven’t found what the connection is. His father, Seth is mentioned in several places as well. Even the Political party strength in Connecticut Kids Encyclopedia mentions Seth Logan (D) from 1870. Until writing this blog, I had no idea they were in politics too! Some of these articles about the family above are the first I’ve seen. It has been a while since I’ve worked on this Logan line and it is amazing how far the online records and digitized articles have come. I have a lot of work to do, but wanted to share what I have so far. Seth’s parents were Mathew Logan and Laura Sanford, farmers. This Mathew’s father was Mathew Logan, Sr. married to Sarah Savage. Mathew, Sr. (DAR# A071144) was our Revolutionary War veteran as was his brother, James (DAR# A071130), whose name is also on this memorial. The Gideon below is Walter’s great-grandfather. Stay tuned, I know there is more to come. Keep fighting the good fight, Dan. Your ancestors are smiling down on you.